Chuck Norris facts are satirical factoids about American martial artist and actor Chuck Norris that have become an Internet phenomenon and as a result have become widespread in popular culture. The 'facts' are normally absurd hyperbolic claims about Norris' toughness, attitude, virility, sophistication, and masculinity. Chuck Norris facts have spread around the world, leading not only to translated versions, but also spawning localized versions mentioning country-specific advertisements and other Internet phenomena. Allusions are also sometimes made to his use of roundhouse kicks to perform seemingly any task, his large amount of body hair with specific regard to his beard, and his role in the action television series Walker, Texas Ranger. Chuck Norris facts originally started appearing on the Internet in early 2005. Initially distributed in the Something Awful forums, the "facts" centered on Vin Diesel, in response to his film The Pacifier. 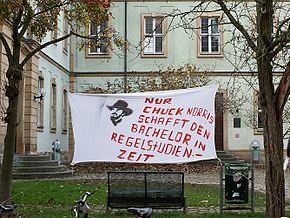 After a few months, forum members chose Chuck Norris to be the new subject. Conan O'Brien's Chuck Norris jokes on Late Night with Conan O'Brien (which generally center on Walker, Texas Ranger) have been seen as an inspiration for the fad. The exaggerated style of these claims is similar to a recurring Saturday Night Live sketch called "Bill Brasky". Due to the popularity of this phenomenon, similar jokes have been created for various other celebrities, as well as fictional characters. Norris responded to the Chuck Norris facts on his official website with a statement. Admitting some of the statements were indeed humorous, he said he tries not to take any of them seriously, and he hopes that such statements will interest people in real facts about him contained in his literary works. On October 23, 2006, Chuck Norris' first column for WorldNetDaily consisted of another response. It began similarly to the above statement from chucknorris.com, but then disclaimed his own prowess in favor of those of God and Jesus Christ. On November 29, 2007, Gotham Books, the adult division of Penguin USA, released a book entitled The Truth About Chuck Norris: 400 facts about the World's Greatest Human. Norris subsequently filed suit in December against Penguin USA claiming "trademark infringement, unjust enrichment and privacy rights". Norris dropped the lawsuit in 2008. On October 7, 2009, Tyndale House Publishers issued The Official Chuck Norris Fact Book, which was co-written and officially endorsed by Norris. Norris has stated that his personal favorite "fact" is that people wanted to add Chuck Norris to Mount Rushmore, but the granite was not tough enough for his beard. In the March 20, 2006 issue, Time magazine interviewed Chuck Norris, calling him an "online cult hero". In the answer to their last question, he called the Chuck Norris Facts "weird but wildly popular sayings" and quoted one: "Chuck Norris can divide by zero." In 2011, a commercial for World of Warcraft featured Chuck Norris and included its own "Chuck Norris facts" in the dialogue. In India, there exist similar jokes in the form of factoids and quotes about Indian film actor Rajinikanth. The factoids about Rajinikanth are inspired by Chuck Norris facts in that those follow the same pattern as Chuck Norris facts. While some Rajinikanth jokes are original, many of them are circulated with Norris' name replaced by Rajinikanth's. The beginning of 2013 saw similar cluster of jokes gaining trend in the country on Indian cricketer Ravindra Jadeja after Indian cricket captain Mahendra Singh Dhoni tweeted a few "facts" about him on his Twitter page. During the 2012 Armenian parliamentary election, some ballots with Chuck Norris' name written on them as a candidate were found. In Egypt, and prior to the Egyptian presidential election, 2012, similar jokes were made upon Omar Suleiman, the ex-director of the General Intelligence Directorate in the same style of Chuck Norris facts, making fun of the powers and skills that his supporters claimed to be his to promote him before the elections. In the episode "The Weird World of Wyrm" of the 2012 CGI series version of Teenage Mutant Ninja Turtles, a holographic Chris Bradford – a parody of Norris – delivers a Norris Facts-esque quotation: "Chris Bradford fact #48: Chris Bradford always carries around four weapons of mass destruction: His arms and his legs." Buffalo Bills fans began promoting similar tall tales about former linebacker Kiko Alonso during the 2013 season, after Alonso joined the team as a rookie. The tall tales were collectively known as "The Legend of Kiko Alonso". Makmende, a Kenyan male fictional character, hero has been likewise purported to perform locally related feats and more, including in sheng. In 2006 a naming poll was held to decide the name of a new bridge in Hungary. Since nominations were accepted from everyone, Chuck Norris soon became the top candidate (beating several historical figures along with candidates like David Hasselhoff and Eric Cartman), before being taken over by Stephen Colbert after he called his fans to vote. The bridge was eventually named Megyeri Bridge. WWE wrestler Brian Myers, known as Curt Hawkins, incorporated the Chuck Norris facts into his gimmick in August 2016, where he uses his name instead of Norris, e.g., "Children have to put sunscreen on at the beach to protect themselves from Curt Hawkins". In 2008, Gameloft produced Chuck Norris: Bring On the Pain, based on the popularity of film actor developed on the internet with the Chuck Norris facts for mobile device. The player takes control of Chuck Norris himself in a side-scrolling beat 'em up. The game was well-reviewed. In 2017, Flaregames produced Non Stop Chuck Norris isometric an action-RPG game for mobile device and is the second game to be based on his popularity developed by the Chuck Norris facts. The game was also well reviewed. ^ Ian Spector (2007). The Truth About Chuck Norris: 400 Facts About the World's Greatest Human. Gotham. ISBN 978-1-59240-344-8. ^ Kearney, Christine (2007-12-21). "Chuck Norris sues, says his tears no cancer cure". Reuters. Retrieved 2007-12-23. ^ "Chuck Norris kicks suit vs. L.I. student". NY Daily News. ^ "Chuck Norris facts read by Chuck Norris". YouTube. Retrieved June 29, 2013. ^ Keegan, Rebecca Winters (2006-03-20). "People". Time. Retrieved 2006-06-20. ^ Benedetti, Winda (November 21, 2011). "Chuck Norris lends his face, fists to 'World of Warcraft'". In-Game. MSNBC.com. Archived from the original on December 19, 2011. Retrieved December 10, 2011. ^ Iyer, Meena (October 11, 2011). "Rajinikanth vs Chuck Norris". Times of India. ^ Venkateswaran, N.; Ravi, Bhama Devi (October 16, 2010). "'I am what I am'". The Times of India Crest Edition. Archived from the original on April 30, 2012. ^ "Rajini humour". Times of India Crest Edition. October 16, 2010. Archived from the original on September 9, 2011. ^ "Rajini jokes sell out faster than his tickets". IBNLive. ^ "Dhoni cracks jokes on 'Sir' Ravindra Jadeja - Times of India". ^ "Armenians prefer to see Chuck Norris and local model in parliament – voters' ballot". NEWS.am. May 6, 2012. Retrieved July 11, 2012. ^ Խորհրդարանական ընտրությունների "հայտնությունը". ոմանք ընտրել են Չակ Նորիսին և "Եկատիրինին" (լուսանկարներ) (in Armenian). Թերթ.am. May 6, 2012. Retrieved July 11, 2012. ^ "Չակ Նորիսը" որպես հայկական ընտրությունների ֆենոմեն (in Armenian). Mediamax. May 6, 2012. Retrieved July 11, 2012. ^ بحث جوجل : هل تعلم ان عمر سليمان [Google search: Did you know that Omar Suleiman] (in Arabic). ^ Kiko Alonso quickly wreaking havoc, becoming 'legend' as rookie with Buffalo Bills. Associated Press (October 2, 2013). Retrieved October 3, 2013. ^ "Chuck Norris leads vote for Budapest bridge name". Reuters. August 8, 2006. Archived from the original on 2005-12-25. ^ Staff, I. G. N. (17 July 2008). "Gameloft Releases Chuck Norris: Bring on the Pain". ^ "Chuck Norris: Bring on the Pain! Review". ^ "Chuck Norris: Bring on the Pain review". ^ Myers, Meghann (December 4, 2009). "Chuck Norris: Bring on the Pain for IPhone". PC World. ^ "Chuck Norris: Bring on the Pain cell-phone game by GameLoft". www.videogamesblogger.com. 2008-08-27. ^ "Chuck Norris: Bring on the Pain! My Games Statistics for iOS (iPhone/iPad) - Collections, Tracking and Ratings - GameFAQs". www.gamefaqs.com. ^ "Nonstop Chuck Norris review - Entertainment Focus". www.entertainment-focus.com. 2017-04-20. ^ "Nonstop Chuck Norris Review: Deja Chuck". 25 April 2017. Farhi, Paul (Jan 2, 2006). "Tough Love: Norris Fans Board the Chuck Wagon". Washington Post. This page was last edited on 20 January 2019, at 02:40 (UTC).